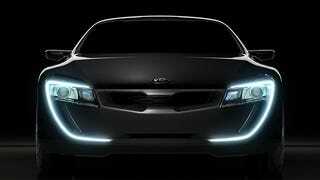 Kia's all set to reveal a sports coupe concept car in Frankfurt this September. The 2+2 concept's coming out of Kia's Euro studio run by chief designer Peter Schreyer. The name may remain a secret at present, but what we do know from the grinning shot above is it should have less of the dour and sad face we saw in the Kia ex_cee'd cabrio concept shown in Geneva earlier this year. Full press release after the jump. Kia Motors Corporation has confirmed that its all-new sports coupe concept car will make its World Premiere at this year's Frankfurt International Motor Show on 11 September. Conceived by Kia's design team in Europe under the guidance of Chief Design Officer, Peter Schreyer, and manufactured in Europe, the new concept car, whose name remains secret at present, is a 2+2 coupe with an imposing road presence. Revealing the first 'preview image' of the new car, Schreyer enthused, "Kia has given me the opportunity to shape its whole brand design and character. Seldom does a designer have such a clean sheet to work with. We started this exciting journey with the Kia ex_cee'd cabrio concept at the Geneva Show back in March, and at Frankfurt I'm sure Kia will surprise the entire automotive world when people see our new sports coupe concept in the metal." Schreyer was recently awarded an Honorary Doctorate in recognition of his contribution to automotive design by the Royal College of Art (RCA), the UK's pre-eminent school of art and design. The 53-year old Bavarian studied transportation design at the RCA in 1979/80 and worked at Audi and Volkswagen for the next 25 years, producing designs for vehicles such as the Audi TT and the new VW Beetle. He was appointed to his newly created role at Kia Motors in September 2006.